In this article, we learn about the deadlock and also discuss about the methods for handling deadlock in operating system. In the multiprogramming operating system, there are a number of processing which fights for a finite number of resources and sometimes waiting process never gets a chance to change its state because the resources for which it is waiting are held by another waiting process. A set of a process is called deadlock when they are waiting for the happening of an event which is called by some another event in the same set. Here every process will follow the system model which means the process requests a resource if not allocated then wait otherwise it allocated will use the resources and release it after use. There are mainly four methods for handling deadlock. It is the most popular method and it acts as if no deadlock and the user will restart. As handling deadlock is expensive to be called of a lot of codes need to be altered which will decrease the performance so for less critical jobs deadlock are ignored. Ostrich algorithm is used in deadlock Ignorance. Used in windows, Linux etc. It means that we design such a system where there is no chance of having a deadlock. It can’t be resolved as it is the hardware property. For example, the printer cannot be simultaneously shared by several processes. This is very difficult because some resources are not sharable. Hold and wait can be resolved using the conservative approach where a process can start it and only if it has acquired all the resources. Here the process acquires only requires resources but whenever a new resource requires it must first release all the resources. Here there is a maximum time bound until which a process can wait for other resources after which it must release the resources. In order to remove circular wait, we assign a number to every resource and the process can request only in the increasing order otherwise the process must release all the high number acquires resources and then make a fresh request. In no pre-emption, we allow forceful pre-emption where a resource can be forcefully pre-empted. The pre-empted resource is added to the list of resources where the process is waiting. The new process can be restarted only when it regains its old resources. Priority must be given to a process which is in waiting for state. Here whenever a process enters into the system it must declare maximum demand. To the deadlock problem before the deadlock occurs. This approach employs an algorithm to access the possibility that deadlock would occur and not act accordingly. 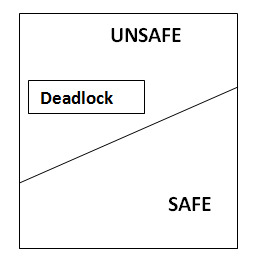 If the necessary condition of deadlock is in place it is still possible to avoid feedback by allocating resources carefully. When a system can allocate the resources to the process in such a way so that they still avoid deadlock then the state is called safe state. When there is a safe sequence exit then we can say that the system is in the safe state. A sequence is in the safe state only if there exists a safe sequence. 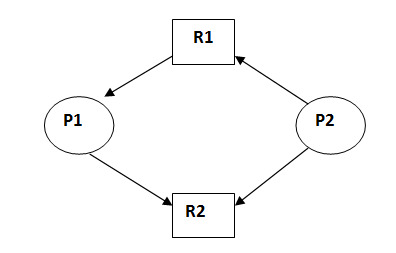 A sequence of process P1, P2, Pn is a safe sequence for the current allocation state if for each Pi the resources request that Pi can still make can be satisfied by currently available resources pulls the resources held by all Pj with j<i. This graph is also kind of graphical bankers' algorithm where a process is denoted by a circle Pi and resources is denoted by a rectangle RJ (.dots) inside the resources represents copies. Presence of a cycle in the resources allocation graph is necessary but not sufficient condition for detection of deadlock. If the type of every resource has exactly one copy than the presence of cycle is necessary as well as sufficient condition for detection of deadlock. This is in unsafe state (cycle exist) if P1 request P2 and P2 request R1 then deadlock will occur. The resource allocation graph algorithms not applicable to the system with multiple instances of the type of each resource. So for this system Banker’s algorithm is used. Here whenever a process enters into the system it must declare maximum demand possible. At runtime, we maintain some data structure like current allocation, current need, current available etc. Whenever a process requests some resources we first check whether the system is in a safe state or not meaning if every process requires maximum resources then is there ant sequence in which request can be entertaining if yes then request is allocated otherwise rejected. Then we check whether the system is in deadlock or not and find the safe sequence of process. Deadlock can be eliminated by aborting a process. Abort all deadlock process. Abort is processed at a time until the deadlock cycle is eliminated. This can help to recover the system from file deadlock. To eliminate deadlock using resources preemption, we prompt the same resources pas processes and give these resources to another process until the deadlock cycle is broken. Here a process is partially rollback until the last checkpoint or and hen detection algorithm is executed.